The Sea Wolves sets out to disprove the notion of ""the Big Bad Wolf,"" especially as it is applied to coastal wolves--a unique strain of wolf that lives in the rainforest along the Pacific coast of Canada. Genetically distinct from their inland cousins and from wolves in any other part of the world, coastal wolves can swim like otters and fish like the bears with whom they share the rainforest. Smaller than the gray wolves that live on the other side of the Coast Mountains, these wolves are highly social and fiercely intelligent creatures. Living in the isolated wilderness of the Great Bear Rainforest, coastal wolves have also enjoyed a unique relationship with man. The First Nations people, who have shared their territory for thousands of years, do not see them as a nuisance species but instead have long offered the wolf a place of respect and admiration within their culture. 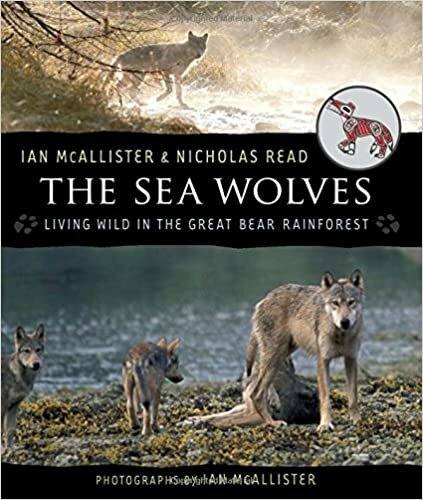 Illustrated with almost one hundred of Ian McAllister's magnificent photographs, The Sea Wolves presents a strong case for the importance of preserving the Great Bear Rainforest for the wolves, the bears and the other unique creatures that live there.